While you guys on the other site of the ocean (America) where drooling over and watching at swords and such on shows. 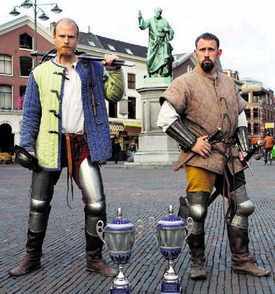 My/our teacher European Medieval Martial Arts "Mishael A. Lopes Cardozo" and his companion "Kenneth J. Smolders" did again (twice in a row) become the European Champion Stage Warriors II at the Furor-et-Ferrum Tournament. What do you say of that!!?? THE DUTCH RULE!!! yeah! I am great fan of everything Celtic BC, including there weapons.